as the hilarity ensued in the dreamy woodland copse to the point that even the actors giggled onstage. 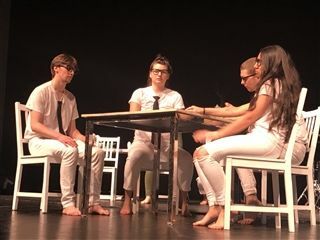 The set and costumes were spare (all characters with the exception of the mischievous Puck in white t-shirts and white jeans), not only allowing Shakespeare's language to shine but for the actors to don glasses, ties, and other props to convey a character change. 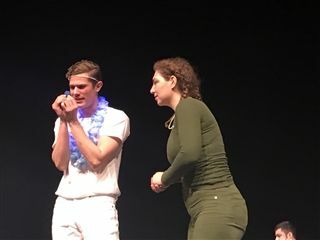 The play interspersed music throughout, a drum, bongo, kazoo, and flute to help propel the story forward and delineate characters. 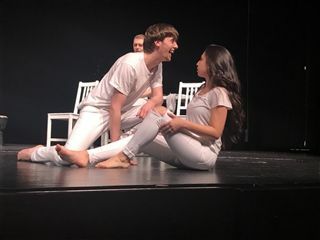 The acting company compressed the three-hour play into 90 minutes without disrupting the lighthearted plotline or integrity of the play’s spirit. 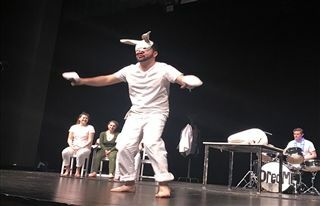 A Midsummer Night’s Dream was presented through the Goodman Banks Series. 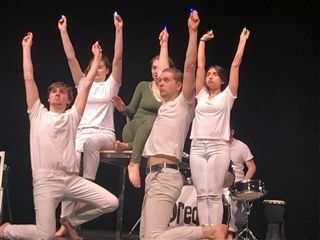 Students experience the creative process firsthand as they work with visual and performing artists from around the world. 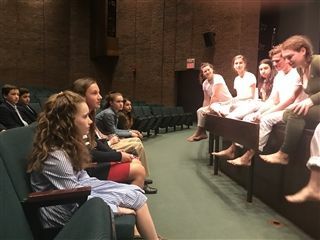 Through performances and master classes, artists share their techniques, processes, and creations with Middle and Upper School students who come to know life through the eyes of working artists.